AH invited me over her place tonight to celebrate Escalade (The Climbing Festival, literally), which was actually celebrated one month ago on December 12 every year.This is a Swiss holiday, more specifically, it is celebrated in Geneva. In 1602, the region defeated the attacking Savoys. Nowadays it is a huge celebration. It is a bit like a combination of Halloween and mid-winter celebration. 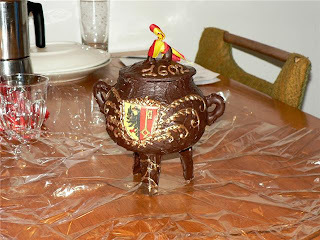 There are many attractions but a good one is a pot made out of chocolate called Marmite. The pot is filled with vegetable-shaped marzipan. As legend goes, a woman was making vegetable soup when she saw invaders coming and threw the soup at them, killing them. People can get these pots in the supermarket and also in special chocolatiers (just like Moon Cakes! )The people who get to break the pot are the oldest and youngest ones in the room. The two people join hands over the pot, say "Ainsi périssent les ennemis de la République!" (The enemies of the Republic should perish!) and then smash the pot. 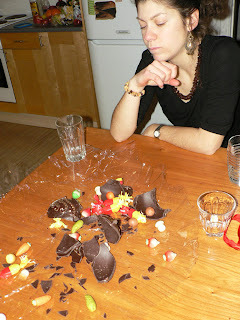 The chocolate went all over the place and we started eating the pieces. I got full really quickly as it was rich Swiss chocolate. M contemplating which piece she'd like to gobble down first. In Geneva, to celebrate the occasion there are also races in the street, and parades with drums and fifes, and people dress up in costumes of all kinds. And then, since AH lives with Icelandic people, as I was writing this a large group of people suddenly came into the kitchen to plan demonstrations! Thanks goes out to AH for the pics. Kreppa = Kr = ?